A World of Colour and Whites- Perfect atmosphere. From the warmest & coolest whites to any colour under the rainbow. Detect Your Presence- Sensing your phone, your lights can turn on & off without hitting a switch. It's alive! Sort of. Wellness Lighting- Tune your body's natural rhythm by replicating the sun's daily colour cycle. Namaste. Light Your Routine- Schedule a sunrise. Dine in candlelight. Shake your phone for a nightlight. Convenient? Yup. Vacation Security- Hey, you're home! Or are you? Have your lights turn on & off randomly while you're away. Music's New Best Friend- Sync your music and watch your Smart bulbs move to the beat of your fancy dancing feet. 2 year limited mfg. warranty on parts and labour. Call 888-502-0575 for complete details. HomeBrite by Feit Electric offers an easy, convenient, and cost-effective way to introduce smart lighting into any home or business. Simply install HomeBrite LED bulbs and download the free HomeBrite app to your phone or tablet to begin controlling and customizing your lights. The HomeBrite App serves as a virtual mobile light switch, which allows you to dim and power lights on and off, set schedules and timers, create scenes, and manage groups. HomeBrites Bluetooth Smart Mesh technology allows the LED bulbs to seamlessly and securely communicate with one another, expanding the range for whole-house control. They use 80% less power than traditional bulbs, making them energy efficient to boot. This 65 watt replacement BR30 LED uses up to 80% less energy. This LED bulbs lasts more than 20 times longer than your standard incandescent and up to 25,000 hours or 22.8 years. Enjoy all the benefits of advanced LED energy-saving technology with the dimmable Feit Electric AT19 6.5W The Original Vintage LED Light Bulb. It produces a light output of 250 lumens and uses 6.5 watts of electricity. Get instant on to full brightness with relatively cool running performance. The Original Vintage LED light bulbs have an average life of 15,000 hours / 13.7 years are RoHS compliant and are 100% mercury free. Choose a dependable decorative bulb for residential or commercial applications. 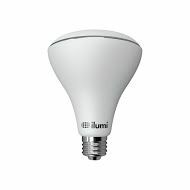 The illume A-19 8W Multi-color and pure whites Smart Bulb has vibrant colors and superior consistency. Dimmable through app and always on hand. The illume app lets you easily manage your homes lighting anywhere, anytime and you can download it for free on your smart device. There is no need for a hub since its using WiFi technology. In pure whites it can range from 3000K to 6500K. Its a great and easy way to add ambiance to any room. You can also group bulbs together for better control over your house. Works with Google assistant and Amazon Alexa.